Amazing. Wonderful. Fantastic. Fun. Beautiful. Yummy. That’s just a quick summary. I stuffed my brain so full of new information that it took me three days to start processing properly again. I have many, many pictures, and many, many wonderful memories, and I will try to put some here soon. Met some wonderful gals, got lotsa fun swag, including books of course, and planned my career for the next two years at least. Soooo wonderful. Even when I knew it was going to be an unforgettable experience, it still turned out even better than that. 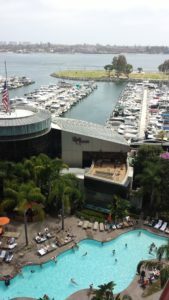 Here’s a photo from our hotel balcony our first day in San Diego. Next > Plaid, Air Force, whatever.